So you can waterstart and foil around comfortably with straps, then you ditch the straps and spend all this time dicking around in the water when you could be foiling!? It’s easy to just give up and screw the straps back on and enjoy what you can already do but I promise you its a short learning curve that just requires a little perseverance over your first couple of sessions but it won’t take long to start waterstarting consistently and as soon as that starts happening you find you’ll get your confidence back and be less concerned about crash out at sea! Also, you can make it easier on yourself – start your session with your straps, get warmed up and comfortable foiling then come back, lose the straps and you will be far more in tune with your kite, board and foil. Waterstarting strapless in lightwinds is a skill unto itself and if this is where you are starting out you may struggle. In very light winds (sub-12 knots) you will probably find you need to be paying far more attention to your kite and the kite will move far slower, making it hard to keep the board in the right position before the kites power kicks in. So I’m not saying you can’t learn in lighter winds but your first attempts will be easier with a little more blow. Now just because we want a little more wind and a more responsive kite doesn’t mean we want to throw it around all over the place. That lack of a front strap means a bit to much power can easily lose you control of the board, sending you flying off. To start with you want to drive the kite enough so it generates just enough power to get you up onto the board, and allows you to get stead riding off the foil. Once you feel balanced rise up and start foiling. You may find riding with a slightly smaller kite can help until you get your muscle memory dialled into riding strapless. This one may split opinion but I’ve found that in general people find the strapless waterstart easier with a low volume board (typically the ABS/Tiwntip style construction). The reason why this may help you is that a low volume board, when sat on its side will partially submerge, sitting lower and can be easier to then keep on its side. This can also be true for lighter weight and more floaty foils, that will more naturally sit on the surface of the water, again making it easier to keep the board on its side. OK, this isn’t a new point, I take about it repeatedly in the main Waterstarts – Strapless video but its so important I’m just gonna say it one more time! Having the board on its side and keeping it there right up until the moment you get pulled up by the kite is vital and you just have to do whatever it takes to make that happen. 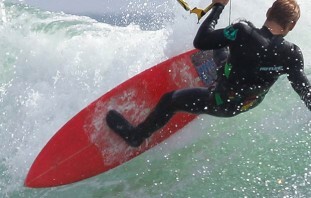 One last thing related to this – in the videos I talk about keeping the board perpendicular to the wind. Someone picked me up on this and asked what perpendicular means! Sorry, that is the mathematics major in me trying to get back out – a bad choice of words particular for those for whom English is not their first language. Perpendicular means “at right angles to”, what I should have said is the board should be pointing across the wind and there should be a wind arrow graphic! I’m adding this to an update of the main video in the near future. End of maths lesson and hopefully a little more insight into the strapless waterstart. I’d love to hear how you are finding riding strapless? Did the videos help, any additional tips and are you tempted back to your straps? 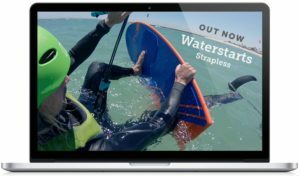 The Waterstart – Strapless video is available to buy and watch now on the Progression Player website, though if you already own the Kitefoiling Volume 1 Collection its been adding to your library for free. You can also download it through the Progression Player App for iOS and Android.